The cars and stars of the MJS / Prime Lift East Coast Mini Stock Tour roll up to Riverside International Speedway on Friday for the Passione Flooring and Interiors 50. The 50-lap feature is round four of seven on the 2018 season and first of two stops at the James Rivera oval this year. The Passione Flooring and Interiors 50 is the opening round of the NASCAR Pinty’s Series Bumper to Bumper 300 weekend and will join the NAPA Sportsman Series on Friday night’s card. Matthew Warren (White’s Lake, NS) has moved to the point lead on the Series after his first career MJS / Prime Lift East Coast Mini Stock Tour victory. Warren battled with Jesse Deveau (Greenwood, NS), his brother Andrew Warren (White’s Lake, NS) and Darren Flemming (Belnan, NS) for the win in the Bruce Honda Showdown on the Shore at Lake Doucette Motor Speedway on August 5th. Warren, a multiple time champion at Scotia Speedworld, has a two point advantage on Dave Matthews (Kennetcook, NS). Matthews won the opening round for the Tour in May at Petty International Raceway. Andrew Warren, who won at Scotia Speedworld in June, sits only three points back from his brother in the championship chase. Andrew Warren finished second in this race one year ago driving the car currently campaigned by his brother. The Honda CRX that now has the No. 85 on it went to victory lane two years ago at Riverside in an invitational four cylinder race, then driven by Matt Watson (Miscouche, PE). Watson, still in search of his first Mini Stock Tour victory, will be in the field looking to drive his Honda Civic to victory lane. Tim Webster (Beaver Bank, NS), who won the inaugural MJS and Prime Lift East Coast Mini Stock Tour race at Riverside International Speedway en route to the 2017 championship, sits fourth in the standings heading into Friday night. Webster had an uncharacteristic “off night” at Lake Doucette Motor Speedway where he finished eleventh after having to pit late in the race. Expect Webster to be back into top form on Friday and not only race to defend his Riverside win but close the 16 point gap between himself and Warren for the championship with four races to go. Flemming has had a breakout season of sorts. While he has yet to win a Mini Stock Tour event, he has three wins on the season in weekly competition throughout the region. This will be Flemming’s second Riverside start after finishing 17th here one year ago. Deveau and “The Ironman” Drew MacEachern (Dartmouth, NS) come into Friday with a head of steam. In addition to his podium runs in the last two Mini Stock Tour events, he was a winner last weekend at Scotia Speedworld in the Thunder division. MacEachern looks for another trophy Friday night in the Passione Flooring and Interiors 50. Cody Byrne (Orwell Cove, PE), Taylor McLean (New Glasgow, NS) and Neil Miousse (Kentville, NS) have competed in all three events thus far on the Mini Stock Tour and are looking for strong runs on Friday. With Scotia Speedworld, Petty International Raceway and Oyster Bed Speedway idle this weekend, a number of their weekly competitors are expected to make the trek to Riverside. Chris Garnett (Havelock, NB), Jason Pickles (Meaghers Grant, NS), Greg McKay (Eastern Passage, NS), Jerome Tracey (Port Hawkesbury, NS), Nic Baker (Upper Sackville, NS) and Chris Hatcher (Beaver Bank, NS) will all make their third starts of the season in the Passione Flooring and Interiors 50. Gerald Gallant (Miscouche, PE) and Tyler Larkin (Montague, PE) will make the haul from Prince Edward Island while David “Hibby” Hibbs (Lower Sackville, NS) and former Island Speedway champion Chris Drover (Lower Sackville, NS) will look to add to their trophy cases Friday night. Petty International Raceway regulars JR Lawson (Shubenacadie, NS) and Chantel Ackles (Shubenacadie, NS) will look to transfer success from one high banked oval to another. Alex Landry (Antignonish, NS), driving for James Sample, will make his Riverside debut in the No. 37 car. 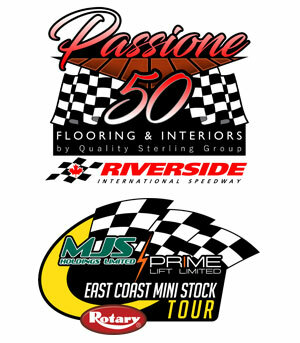 The Passione Flooring and Interiors 50 starts a busy four week stretch that will boomerang back to Riverside International Speedway on September 8 to crown a Tour champion. The Series heads to Petty International Raceway next Saturday, August 25th before heading to Speedway 660 for the Pub’s Drive Thru Bottle Exchange 50 on Saturday, September 1st. A champion will be crowned at Riverside International Speedway in a 50-lap feature on Saturday, September 8th. In addition to the Giles Auto World Pole Challenge and the EIT Race Radios Hard Charger Award being up for grabs, the Passione Flooring and Interiors 50 is a qualifying race for the United Rental Dash for Cash. The top four drivers in Friday night’s 50-lap feature will qualify to race for a $100 bonus courtesy of United Rentals at the August 25 event at Petty International Raceway. (55) Neil Miousse, Kentville, NS – TCI Manufacturing Inc. The NASCAR Pinty’s Series Weekend kicks off Friday with the Henry’s AUTOPRO 100 for the Napa Sportsman Series and the Passione Flooring Mini 50 for the MJS Holdings/Prime Lift East Coast Mini Stock Tour. On Saturday it’s the NASCAR Pintys’ Series Bumper to Bumper 300 and the Maritime League of Legends Celtic Air Services 50. Passione Flooring and Interiors offers the highest quality of products from the Quality Sterling Group. Whether it is tile, carpet, hardwood, laminate or the world class service and installation, they can do it all! Their new state of the art location is now open at 64 Burbridge Avenue in Dartmouth’s Burnside Industrial Park. Visit them today or call (902) 482-4093 for expert advice on your next flooring and interior project! The Quality Sterling Group line of products and services can be found online at QSG.ca. Prime Lift operates as a division of Prime Material Handling Equipment and the exclusive distributor for Rotary automotive lift sales, installation, inspection, parts and service in Atlantic Canada. From the day you decide to go Rotary, from selecting the right automotive lift, installation method, thorough safety inspections and servicing – Prime Lift is dedicated to continuously deliver more value and keep our customers safe! Visit them online at www.Prime-Lift.com. The East Coast Mini Stock Tour was formed in December 2016 to give Mini Stock racing in the Maritime Provinces a unified home. Featuring four cylinder Honda models, the series will host events at five oval race tracks throughout Atlantic Canada in their seven race season. For complete information on the East Coast Mini Stock Tour, please visit EastCoastMiniStockTour.com.